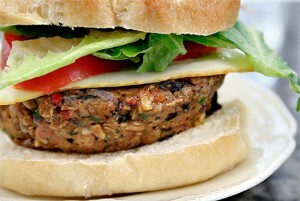 I have tried several veggie burger recipes over the years and this one is by far my most favorite one of all time. Vegetarians and meat eaters alike enjoy the flavor and texture of these yummy burgers. My kids love them and my husband even says he likes them better than regular hamburgers. They freeze really well too, so I always make a double batch to have on hand for a quick and easy meal, and for taking to summer barbeques. I have also used this same exact recipe to make oven baked “meat balls.” I get tons of requests for this veggie burger recipe, so I want to share it with all of you! other condiments like: sliced cheese, lettuce, tomato, onion, mayo, ketchup, mustard, etc. Heat oil in a skillet over med-high heat and cook onion (not green onion) until tender, about 5 min. Add beans to a large mixing bowl and mash with a fork or use a food processor. When adding the rest of the ingredients to the bowl, you can either add them as is, or use a food processor. Mix all of the ingredients together really well. You can either stop here and store the mixture in the fridge or make the patties immediately. Work with clean hands and use a 1/2 cup measuring scoop to form mixture into patties. Make sure to press them together firmly. This recipe makes around 9 burgers. Chill burgers in the fridge until ready to use. It’s best to let them chill for at least 30 min. so they stay together better when on the grill. If cooking them indoors, see note. Pre-heat grill to med-high. Brush both sides of burgers with oil (so they don’t stick to grill). Cook on the grill for about 5 minutes per side, or until golden brown. Toast buns on grill during the last few minutes of cooking. Add sliced tomato, lettuce, and your favorite condiments. These burgers take a little bit of time to prepare, so that is why I always make a double batch and freeze a bunch. If you want to freeze these burgers, just separate uncooked burgers with wax paper. I usually use a square plastic bowl for storing them. Just thaw them in the fridge and cook on the grill once they are thawed. NOTE: These burgers taste best when cooked on the grill. But if you need to cook them indoors, then you should chill them in the refrigerator for at least an hour, or overnight. This gives them time to firm up so that they aren’t mushy. If using this recipe to make oven baked “meat balls” you will need to form the mixture into balls and place them on a greased cooking tray. Bake in a 350 degree oven for about 30 minutes, flipping at the halfway point. I’m so glad you posted this -I’ve been thinking about making them again! The biggest tip for making these guys work when cooked indoors is just to let it chill for a while, more than 30min. I think I kept them in the fridge an hr or so and they were perfect! Thanks so much for that tip! I just made a new batch this weekend. I am so glad you enjoy this recipe as much as I do!